The CCWB goal this year is to continually span the globe to bring you the constant variety of "wines" available on the market today [yes borrowed a little phraseology from ABC sports]. With that goal in mind and the fact that I always love to try a new wine, I was intrigued by seeing this bottle of French Malbec laying in a bin at my local Costco the other day. It has been far too long since I've reviewed a bottle of French wine, but I am delighted to bring this very reasonably priced bottle of near perfection to your attention. This bottle of French Malbec is not my first encounter with a Cahors Malbec, but sorry I was just not as impressed with my other experiences as I am with this wine in the review spotlight today. 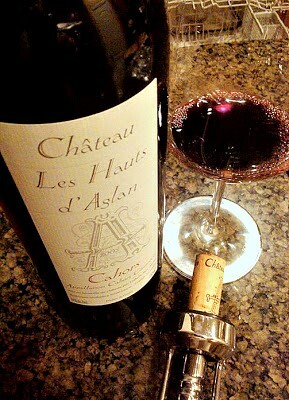 So it's with great pleasure to introduce to you the Chateau Les Hauts d' Aglan 2005 Cahors in the review that will follow. What is Cahors: Many of us are very familiar with Argentina Malbec and have to come to love its beautifully expressed fresh and yet complex fruit flavors, supple tannins and complex minerality stretched over the nuanced canvas of acidity. But in answering the question about what Cahors is, I wanted to remind you of where that noble grape has gone and where it's coming back from; the short answer is that it's the birthplace of Malbec. Cahors has a reputation for its "black wines" [meaning opaque] produced from grapes from high limestone plateau vineyards making for highly extracted [dark] wines built for aging. Cahors is an area with a long, rich history, but had lost its way a bit and is now attempting to rebuild that legacy. Competition: Hey Mendoza I hope you're not resting on your laurels for a second because you can probably see Cahors in the rear-view mirror and they're gaining ground. I know, I know they're not competing. I say that, because as I've seen many other places [other articles] that they [Cahors] are making different types of Malbec [say the play-nice police]. Okay, I must admit in a moment of truth, that the Malbec I had last night was a bit more Bordeaux like in its overall structure and finesse. But that said I still see it as a competition between two equals; especially if the wine I had last night is an example of what's to come and bonus even the price points are very similar. All I'm saying is, Mendoza lookout, as Cahors may have a fantastic kick waiting as a gear it has not shifted into yet, holding it in reserve waiting to throttle its opponent. Competition or not, the juice coming out of these two places is pretty fantastic, so stay tuned. The Many Names of Malbec: According to the International Malbec Days site there are "So many local names for the same grape, to some it's known as Auxerrois in Quercy and Cahors where it originates. But also Pressac, Noir de Pressac or Gros Noir, Cot in the Loire Valley and Malbec in Bordeaux as a small player in blending." the last name [grape] on the list is Malbec, producing the wine we all know and love. Laid down the Gauntlet: There's a movement afoot to grab or take back some of the thunder, that in some quarters perceive as having been stolen by the Argentines. The trade association for Cahors, the region in southwestern France that can legitimately claim to be the homeland of Malbec, wants their grape back [figuratively speaking of course]. Seeing the success of their counterparts in the New World, the Trade Association for Cahors has laid down the gauntlet and challenged the Argentines with their slogan: “Cahors — The French Malbec" as their rallying cry. Swirling, Sniffy, and Slurp: While making dinner I poured myself a couple of ounces to catch a glimpse of the color, in the glass I found an intense garnet and violet colored core, gorgeous aromas of dark cherries, dark ripe plums and just a sprinkling of coffee jumping out at me. After the first sip and swirl about in the mouth, I enjoyed wonderful dark chocolate covered cherry's and seductive supple tannins leading me to the smoky, silky finish. 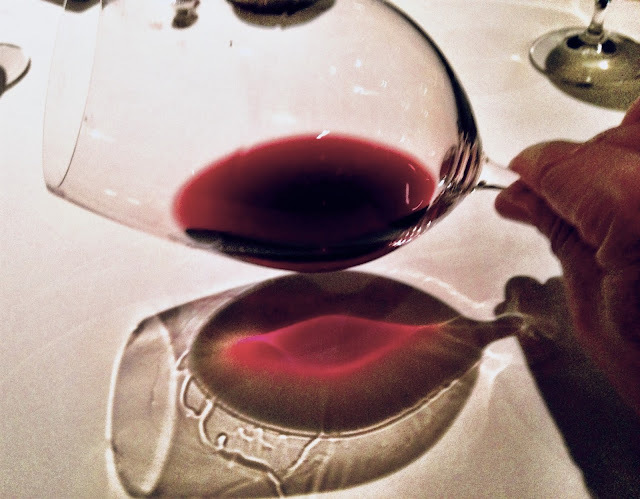 Even after the wine departed, from my glass, I continued to smell the same beautiful aromas and wondered why silently why there was no one bottling it as a fragrance with the same qualities. Discrepancy: Folks I was lead to believe from the back label put on by the US distributor, Wine, Wine Situation Inc. that this wine was 100% Malbec. But if you look at the Chateau Les Hauts d 'Aglan website the actual make up the wine is 90% Cot (Malbec) and 10% Merlot. In my opinion, it's no big deal, nor do I see anything wrong with that, but it would be nice to know which story was true. However, for folks that moan about some wines juicing, they may like to clear up that little issue. Where to Purchase: This is one thing you don't get with most folks who review wines, 'the skinny' on where to get the great wine they are talking about, not here at the CCWB. Nope, I take the time to get the facts that matter [like where you can buy the freaking juice]. This wine can be picked up at most local Costo stores and is selling for $20. This wine is sold out at some of their stores, but the Chula Vista [East H St.] store still has a few in stock. If you don't live in San Diego, check with this excellent online vendor who appears to be selling this wine for $15 and have it in stock ready to go. But the bottle shot does look different than the one I purchased but appears to be the same wine. What's the Score: Okay let's get down to it, this is a fantastic bottle of wine for the price. Refined, complex and delightfully compelling. I scored this wine 95 points, and it's the best buy of the year to date. A definite QPR winner. If this was had been made in California, it would sell for three times that price. Other Voices: The folks over at WS gave this wine a mere 92 points. That's an excellent score, but I gave it three more points to take it this wine toward the classic range, as this wine more than defines the mission statement of the CCWB; which is finding wines on the intersection of "where great wines meet reasonable prices." From the original home of Malbec: Its dark purple color alludes to its old name (the black wine of Cahors). On the nose, this wine is bursting with ripe black cherries, cassis, dark plums, with a touch of cedar and spices such as cinnamon and cloves. In the mouth, if you want to understand what chewy texture means, this is it! The tannins are present but still smooth. Black cherry preserve and cassis are the main flavors, and the finish is long and multifaceted. Ready to drink now, but has enough structure to last another 3-5 years; this is the wine to have with a ribeye steak. My Recommendation: Ummm, wow, so you're still here, what the bleep are you waiting for, grab a few while still can; this is a run don't walk recommendation. Word to the wise, get up off your collective fannies and grab as much of this fantastic juice as you possibly can afford. Because once it's gone, it's gone. Until next time sip long and prosper cheers! I had my first Cahors malbec last night! I was expecting it to be rougher around the edges than the Argentinian malbec, but it wasn't. It was delightful. Watch out, Argentina? This wine is a 100% Malbec, you probably was mistaken checking the web site as they offer two wines, one called 'Chateau Les Hauts d' Aglan 2005 Cahors' and the top wine called 'Chateau Les Hauts d' Aglan - cuvée A - 2005 Cahors'. This later wine is the label that you show and is indeed 100% Malbec: URL is http://www.les-hauts-d-aglan.fr/prod/detail.php?q=20 ...but it's in French! I agree with you: Cahors produces great Malbec wines (I do too!) that people will gain discovering. One misunderstanging is trying to decide which of Argentina or Cahors Malbec is best; both have great producers and bottom line is consumer has to pick the one they prefer. I can find you many 95pts Malbec in Argentina and in Cahors; but which I enjoy best is my own taste! Until consumers understand this, they'll remain fooled by scores. A score is all but a taste or style! Would you marry someone I give a 95pts score based on my criteria?!!! Thanks for the feedback, but regarding the label the word "cuvee" does not appear on the label of the wine reviewed here and thus led me to believe there maybe a discrepancy. But that is neither here nor there, because the larger and more important point is this; that the wine in the review spotlight is fan-freaking-tastic. Second, regarding scores I think I will agree to disagree with you. While you may personally be opposed to "scores" the vast majority of the wine-buying population make their purchasing decisions based on scores and which are a tool that helps give some perspective in a sea of sameness. Most everything in life is given a ranking or score. Take automobiles for example, everyone maybe raving over the "new" Porsche and while I'll admit it's a fantastic vehicle, it's just not the type I like to drive. This is where many consumers will live and die by being merely point shoppers. Lastly, I love competition as it really inspires greatness. I look forward to more wonderful Malbecs from Cahors. Sip long and prosper, cheers! Which one did you have? Have you reviewed it yet? To me they're really different than the Malbecs coming from Argentina. Both are winetasticly great values.